Milk & Honey Naturals features products that are organic, vegan, and of course handmade. Courtney Cascante says her creative process is sporadic & would seem hectic to some people. Inspired by new places & foods encountered when traveling, she gets the creative bug & begins creating until she is simply worn out. Using environmentally-friendly products, Courtney whips up products like Rosemary Lavender soap and Amber, Clove & Nutmeg soap for men. 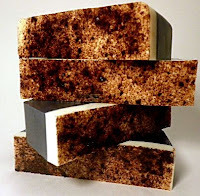 The NY Black & White Snickerdoodle soap (pictured) sounds especially delightful, as does the Revitalizing Mint Chocolate Rosemary soap. If you're looking for a nice gift, don't miss the Organic Exotic Handmade Soap Gift that is made up of four soaps of your choice. Receive a 10% discount with coupon code FUNKYFINDS10. Expires February 28, 2011.